The team at our Skillman restorative dentistry center takes great care when it comes to addressing tooth loss of varying degrees. We want to tailor each treatment to the patient at all times. For major tooth loss, dentures are an excellent option. 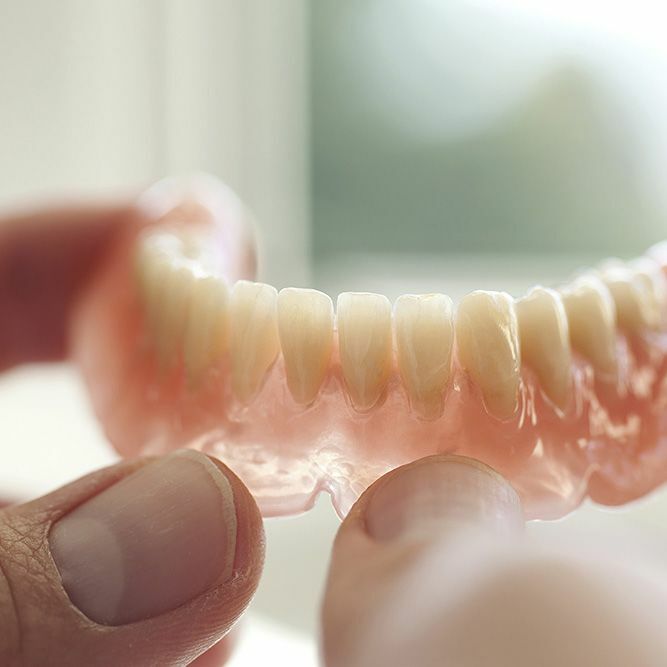 Let's take a moment to discuss the basics when it comes to partial and full dentures, and then consider the many benefits of getting custom dentures. Full and partial dentures are both traditional prosthodontic options for replacing missing teeth. These false teeth are designed to fit comfortably along the dental arch, allowing you to experience all of the benefits of natural teeth again. Partial Dentures – Partial dentures are dentures that are meant for people who are missing multiple teeth but not most of their teeth. This denture braces along the dental arch to restore the appearance of a smile and general biting function. The extent of your tooth loss will determine the right kind of dentures for you. The primary benefit of both partial and full dentures is their ability to restore proper function to your teeth. With a denture or dentures in place, you'll be able to bite and chew just fine again. You'll have fewer dietary restrictions and limitations, and you'll likely be able to enjoy your favorite foods again. Thanks to modern scanning and fabrication techniques as well as an improved understanding of materials, dental labs are able to make dentures that look natural. Even partial dentures can be crafted in such a way that they are indistinguishable from your natural teeth right up to edge of the appliance. This is a testament to how fat dental technology has come over time. When creating a full or partial denture, patient comfort is extremely important to us and the technicians at the dental lab. All efforts will be made to ensure that the denture that is crafted fits securely and is stable when in place. We will always strive to make fit as much a priority as function and smile aesthetics. Some patients may wish to consider getting implant-supported dentures to address their tooth loss. Implant-supported dentures are anchored in place with dental implants, which are artificial tooth roots surgically embedded into the jawbone. The hold on implant-supported dentures is comparable to that of natural teeth, and there a very low chance of these dentures slipping out of place. Since oral surgery is involved and the cost can be an issue for patients, implant-supported dentures may not be an ideal option for you and your needs. This can be discussed in more detail during the consultation process. For more information about dentures and whether or not they are an ideal treatment option for you, be sure to contact our cosmetic and restorative dentistry center today. The team at our practice looks forward to your visit and discussing these issues with you in greater detail.